Wednesday, April 10, 2:30 p.m.
April 4, 2019, Pensacola, Fla. 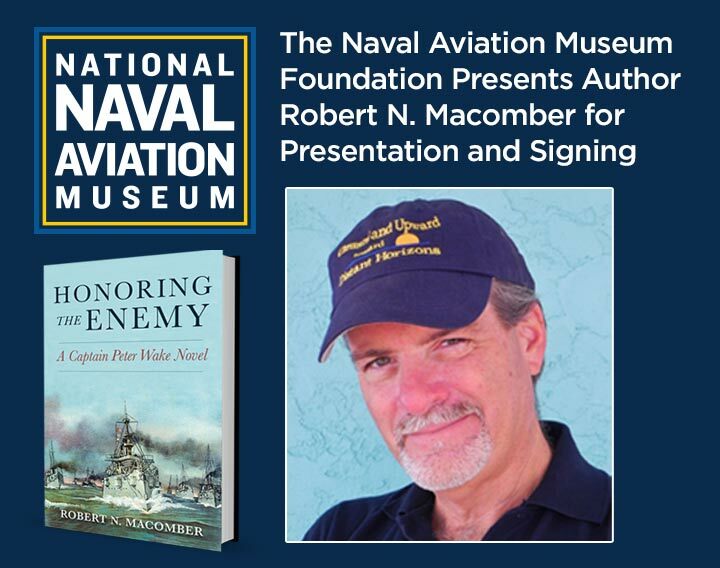 The Naval Aviation Museum Foundation presents author and historian, Robert N. Macomber, on Wednesday, April 10, at 2:30 p.m. Macomber will be making a special appearance for his newest maritime thriller, “Honoring The Enemy,” the 14th novel in his collection, the Honor Series. This newest novel is set in the period of the Spanish-American War, covers from June 1898 to mid-July 1898. “Honoring The Enemy” and his earlier novels convey the real stories and complex qualities of human nature, cloaked in the nuances of the late 19th century. The suspense, romance and compelling strategies reflect not only the trials and triumphs civilians face during wartime, but also the harrowing decisions and sacrifices of those in the military who wrestle with life’s everyday challenges. Inspired by actual events, this page-turner helps us live history and remember truths which should never be forgotten. Over the years, Macomber has been the recipient of the Patrick D. Smith Literary Award, the American Library Association’s W.Y. Boyd Literary Award and the Florida Book Award. The event begins at 2:30 p.m. in the Blue Angels Atrium starting with a 20-minute discussion on “Honoring The Enemy,” plus a 10-to-15-minute Q&A, followed by the book signing. Copies of the “Honoring The Enemy” will be available for purchase at the Flight Deck Store located at the National Naval Aviation Museum. The event is free and open to the public. Learn more at http://bit.ly/2Uuf7WY.